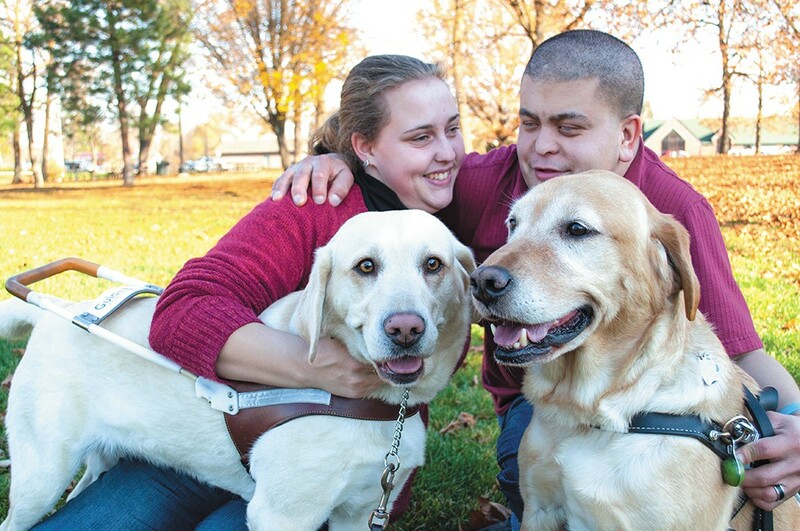 Katrina and Ryan Strickland with their service dogs, Madison and Huntley, at Franklin Park in Spokane. Chihuahuas in purses, puppies in shopping carts, blue heelers off leash in a home improvement store. Pet dogs seem to be appearing more often in public places — sometimes by owners willfully ignoring no-pets rules, or passed off by their fibbing owners as service animals. For most people, pets showing up in strange places is not much more than a curiosity. But for people who depend on service animals, the worry is that unexpected encounters with poorly trained pets may endanger the health and safety of both service animals and their owners. Spokane resident Laura Renz worries about what could happen every time she leaves home. Renz has been using a service dog to aid with her mobility for the past three years as a result of injuries she suffered after a major motorcycle accident in 2012. Her trained service dog, a 1-year-old, female chocolate Lab named Little One, is the third service dog she's had, and offers physical support to Renz as she gets up from a chair. Little One also helps Renz up from the ground when she sometimes falls. About two months ago while shopping at the North Spokane Costco warehouse, Renz was minding her own business when, she says, all of a sudden another customer's dog, sitting in a child stroller, unexpectedly launched itself toward Little One. According to Renz's account, the dog's owner said it was his service animal. Based on her prior experiences with service animals, and the fact that the dog was in a stroller, Renz doubts this, explaining that a trained service dog should never show aggression toward other animals or people — especially unprovoked. "It really upset me, and scared me," Renz recalls, as Little One, wearing a black vest with "service dog" embroidered in white, reclines on the floor next to her chair. "These dogs, even if they perform a service, they can't be jerks — that is where the problems come in." Costco wouldn't comment on the incident involving Renz and her dog, but the company's policy regarding service animals animals follows guidelines of the Americans with Disabilities Act stating that its employees will only approach customers with animals if it's not visually apparent that it's indeed a service animal. Renz is concerned that businesses of all types are doing little to educate their employees on what the law stipulates, or requiring them to enforce it. Though the ADA protects the disabled community against discrimination, the law outlines two specific questions that businesses may ask of a person with an animal: Is this dog required because of a disability? What work or task has the dog been trained to perform? Staff may not, however, ask a person to disclose the nature of a disability or to reveal any other health information. State and federal laws currently do not require any type of registration or licensing for service animals. Only if the handler voluntarily admits an animal is not a service dog, and this violates a store policy regarding pets, can staff can ask for the dog to leave the premises. Under the ADA, only dogs (and oddly enough, miniature horses) qualify to be service animals. The law doesn't recognize emotional support animals that might assist a person with social anxieties in staying calm, though there is a provision that defines psychiatric support animals, which might support a veteran with post-traumatic stress disorder, or remind a person with a psychiatric disorder to take medication. Renz says owners of legitimate service dogs are happy to answer store employees' questions. "Anyone who says 'You can't ask me that,' that's a fake, I guarantee," Renz asserts. "We go through all this training and are glad to say it's a service dog, and what the dog does for us." Several area businesses have started posting their service animal policies near entrances. Some Spokane-area Rosauers stores have recently placed paper flyers by these signs that list the stores' ADA-compliant rules regarding pets. Renz has approached both the Spokane and Spokane Valley city councils to voice her concerns that local businesses are not educating their employees on what is and isn't a service animal, and why pets that could interfere with service animals shouldn't be allowed in areas where dogs usually aren't present. Madison is Katrina Strickland's second guide dog. Her first, Vannie, had to be retired after being attacked by a pet dog in downtown Spokane. Vannie was traumatized and could no longer safely work as a guide dog. "It frightened [Vannie] as much as it frightened me," Strickland recalls. "The woman said she was sorry, but that doesn't do anything when you're messing with someone's eyes. It was a really scary incident." Both Strickland and her husband Ryan use trained guide dogs to get around. "It allows you a sense of freedom that a cane doesn't," Katrina explains. "It allows you a sense of companionship, independence and freedom. It breaks down barriers between you and the sighted world." The couple feel threatened by people trying to pass off pets as service animals. "I think it happens a lot more now that there are websites that allow people to purchase supposed certifications and vests for their dogs — a little jacket that claims they're a service dog, or they can print a certificate for $100," Ryan says. Katrina adds, "We see it more and more. Riding the buses, you see people and they have a big dog and they're like, 'Well, this is my service dog,' and they say that to the bus driver. But then the dog turns out to be aggressive and causes a distraction" to other riders' guide dogs.